Is Rain Water Better than City Tap Water for Plants? Our plants depend on water to survive and thrive, but all water provided to our plants is not equal. Most gardeners can see that rain is more beneficial than city tap water but don’t necessarily know why rain is so much more beneficial to plants than tap water. To understand the advantages of rain water, first let’s take a look at tap water from city treatment reservoirs. It is widely accepted that chlorine is necessary to kill bacteria in our city water. The amount of chlorine present has minimal effect on our plants but certainly is not helpful. Fluoride, however, has been know to injure certain sensitive plant foliage when using large amounts of high fluoride tap water. The most damaging additive in city water is the salt used to soften the water. High salt content in soil can inhibit plant roots from taking in water. Each municipality uses varying amounts of salt to produce what they determine to be optimal softened water, but most city water does tend to be high in salt and minerals, it also tends to be alkaline. If you water frequently with city tap water you may want to test your soil periodically. In extended dry periods you won’t have much choice but to put the sprinklers out, and the effects are relatively minimal. So city water is better than no water at all. 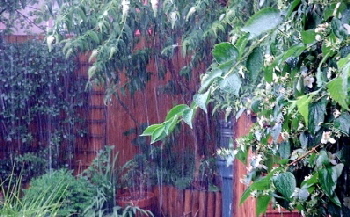 Rain water is naturally soft and contains vital nutrients that are enjoyed by your plants. Nitrogen and sulpher in rain are both very important to your plants, but rain also contains naturally formed nitrate fertilizers and minerals that provide nutrients for your plants. Of course even rain isn’t perfect, it picks up pollution, dust and pollen, but no added chemicals. Rain water can be slightly acidic, levels vary by region. But city water is slightly alkaline. Neither will necessarily be harmful or beneficial unless your soil is already high in the same direction and your plants are not tolerant of such levels. Test your soil to check the pH periodically and select plants that enjoy whatever pH level exists. There is nothing like a good soaking rain for our plants. Even if you have accumulated a fair amount of fluoride, salt and minerals in your soil from city tap water, the rain will help to “flush” them out and dilute them, which will aide in the root development for your plants. But knowing how much more beneficial rain water is, why not get a rain barrel?